It’s a bit of a cop out to re-do a recipe, but I haven’t made this in 3 years! And it’s fantastic, quick and easy to make, and I did put a 2013 spin on it! I also had mentioned it to my coworkers, and they were eager to try it. It’s so easy to make, why not? 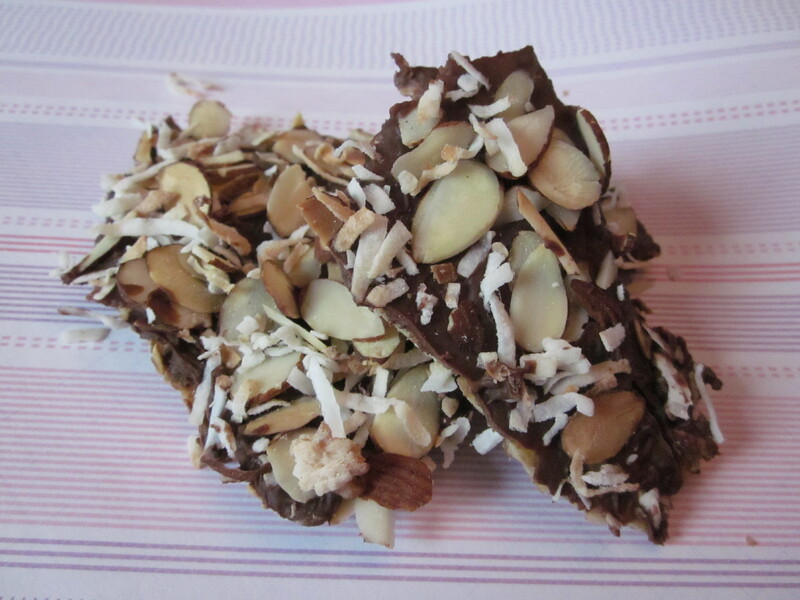 Also, I’ve read a few different matzah bark recipes, and it looks like you don’t really have to bake the matzah with toffee topping for more than about 5 minutes. So, use your discretion with baking time… and with toppings! These two suited me just fine. Preheat your oven according to the directions at the link above. 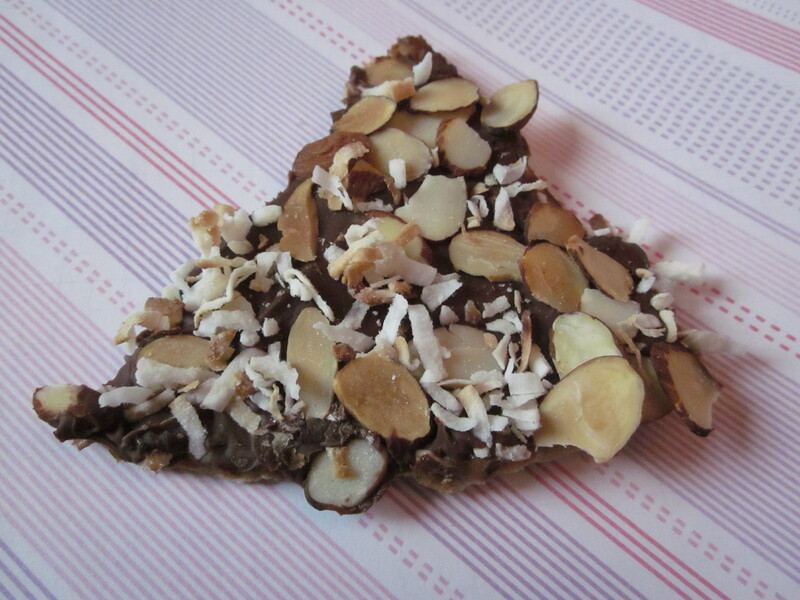 (375ºF) I always use that as a time for multitasking if I can – so I popped a parchment lined tray with the almonds and coconut in there while it was warming up. After you’ve baked the matzah and spread the chocolate chips over the top, sprinkle the additional toppings. Then, let it cool at room temp until it’s able to go in the fridge or freezer to set. Then, share with your coworkers! Or not. I’m definitely hoping to have at least one new recipe for you in the next couple of days, so make sure to check back in! Here’s an update, since I just served these at work. They’re warmly received by Jews and non-Jews alike 🙂 One of my bosses told me they were the s***, someone else commented it’s all her favorite things rolled into one, and generally I’m being thanked by everyone in the office. It’s nice to be on top. Also – a brief moment of hilarity ensued when a coworker pointed out that there are flakes of coconut and almonds trailing down the hallway. Made me giggle. Let’s up this evil rating to a 5, because it’s pure sugar, and someone is already complaining of a tummy ache from eating too much. This looks so tasty! 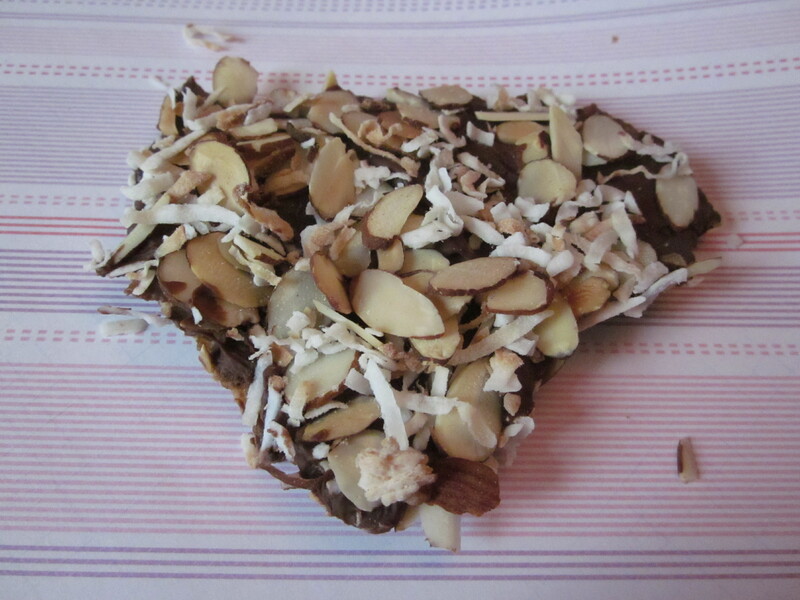 I love chocolates, nuts and coconut. It’s perfect! !